For a green and ethical wedding location, try the obvious first: community gardens, botanical gardens, organic farms, national parks, waterfront, your backyard, nature conservancies and other protected land. Winter weddings are lovely outside, even on the beach - watch for blowing sand, though, it's bad for skin and eyes. 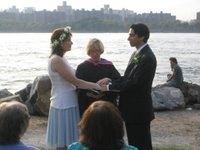 For indoor ceremonies, try socially conscious businesses with meeting areas. Look into the meeting rooms of your local charities, social service agencies and environmental groups. Many have board rooms or meeting rooms with nice views - and they’ve never thought of holding a wedding in their board room! Check into supportive housing agencies (especially in New York and Chicago) who have renovated industrial warehouses and hotels which have nice common areas. Don’t opt for unspoiled nature reserves - you don’t want your guests tramping across the tundra or the wetlands - but find reclaimed lands that are more user friendly, near farms and with road access. Ask your friends and family if they know anyone with a bit of land - but think about auxiliary services (parking, lights, emergencies) and weather. What if it rains? You don't want to crush or compact wet sod or plantings. Transportation? It might be more ecologically correct to take public transit to a city park, than drive everyone out to the acreage. Consider carbon footprint, gas mileage, sunburn, wildlife, bugs, and mud. As an alternative, take engagement pictures in a wildlife or nature area, with only a few people. Set the pictures up on a slide loop at your wedding.